A true and timely tale about love, socks, and fate. From the time I was a wee bairn I loved to create. A box of assorted odds and ends and glue or tape was absolute heaven to me. I knew even then that the purest version of myself emerged when I was in the act of making. When I was around seven years old I made a puppet out of an old, navy sock that had been my father’s. Using scraps of felt, buttons and glue I transformed a utilitarian accessory into a wily dragon, capable of expressing itself with a myriad of emotions. Years later, at age 25, I returned to sock puppets as a vehicle for exploration in the studio. 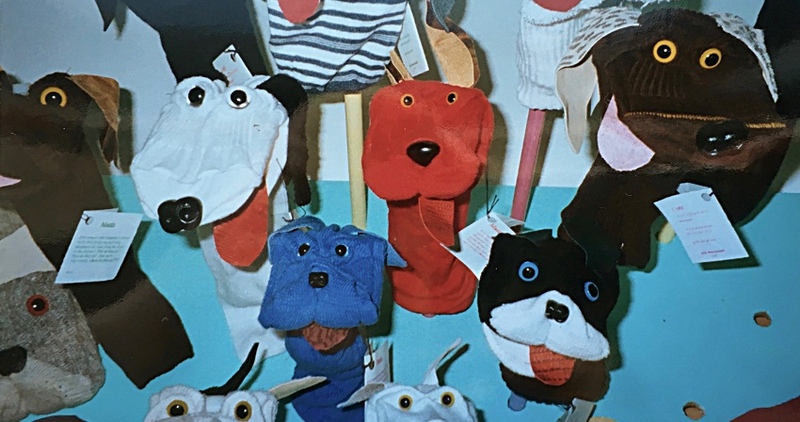 This resulted in a successful micro business, Mutts Puppet Company (Mutts funded a good portion of the tuition for my undergrad degree from 1997-2002. NB – I’m talking Canadian tuition dollars. Not as impressive as it would have been paying U.S.A. tuition, but notable nonetheless). Mutts Puppet Company catered to a niche market. I only made puppets out of socks and I only made puppets that were dogs. With practice I got quite proficient at replicating certain breeds: hound dogs, pugs, Boston terriers, greyhounds, dachshunds, just to name a few. New socks that I had bought were classified as “Purebreds” and personal socks that had a bit of wear and tear and had lost their mates were “Strays”. Vintage Mutts! A digital photo of an actual photograph, circa 1997. For six years I manufactured 50-100 puppets per year and sold them mainly at holiday arts & crafts fairs. It took roughly two months of intensive prep time to create the necessary inventory. Fun, but it was precious time taken away from my art practice. In 2002 I shifted my energy to pursuing exhibition opportunities for my fine art and retired from the sock puppet business. Eight years earlier, in 2001, his ex had bought this puppet from me at a holiday fair and given it to him as a gift. This little orange dachs-y was crafted from a sock that had been worn by me for several years before losing its mate on a trip to the laundromat. Encountering it after so many years was, to say the least, surprising and incredibly emotional. It felt very auspicious that this intimate, and relatively exclusive, object I created had started a relationship with a man I was about to cohabitate with a full eight years before the two of us even met. Coincidence? I suppose chance needs to be acknowledged. But I also love a romantic fairytale steeped in kismet and this satisfies that desire in a most complete way. Today the pup has a place of honour tucked among pieces of our art collection in my husband’s office, a sweet and constant reminder of our predetermined match. That is a true love story if I ever heard one! Ahhh, and I remember washing and folding those favourite orange socks when we were roommates and would do laundry together…and then our part in introducing you two to each other- of course I am going to nuzzle in on your love story Jody, what did you expect? lol . valentines smooches from the wetcoast.